App development: Software vendors develop a Smart UX app using the Software Development Kit (SDK), provided by Samsung upon request. Contract matters: Vendors discuss terms with Samsung pertaining to sales, revenue sharing, customer support and other app-related issues. Verification & Validation (V&V): After completing the development stage, the ISV requests Samsung to test the app’s efficacy. Registration: Apps that pass V&V are registered on the Smart UX Center and made available on the Printing App Center. Revenue calculation: Vendors determine apps’ supply price to Samsung, who will help determine the appropriate retail price for end-users. Customer service: Developers can adapt ISV customer service policies and establish contact points for app developers. This helps customers, and also Samsung, to get in touch should an issue occur. 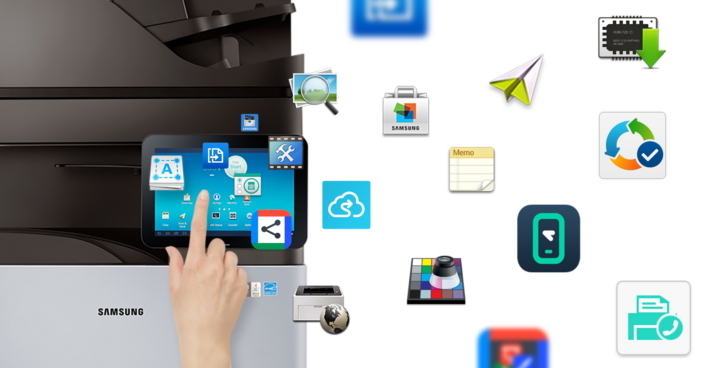 Further information about Smart UX App development and registration can be found on Samsung Printing App Center (http://printingapps.samsung.com) or Printing Solution Market Support Portal (http://www.samsung.com/global/printingmsp/knowledge/Smart-UX-Center.html?guide=apps).